There are a few things that you need to know if you're considering buying Assassin's Creed Liberation HD. The game is a re-issue of a PlayStation Vita game released at about the same time Assassin's Creed III appeared on consoles. 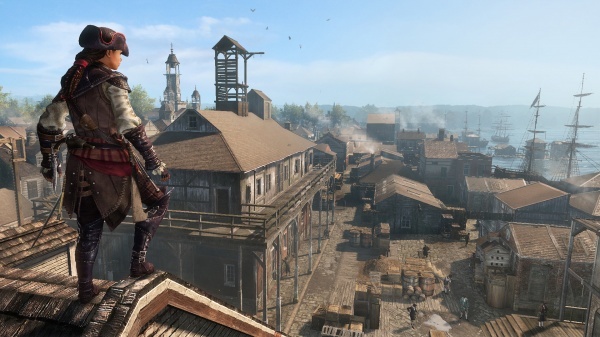 It's been given a graphics overhaul to improve its appearance on larger screens, but visually it's still not on par with Black Flag or Assassin's Creed III. And although the resolution has been increased the game itself is still built on a portable scale. That means that the story is shorter and lighter, the missions are bite-sized, and the game world is small and tightly confined. In short, if you're expecting to continue your Assassin's Creed experience with Liberation HD after finishing Black Flag, then you're better off going with Black Flag's Freedom Cry DLC. However, that doesn't mean that you can't have some fun with this side story in the Assassin's Creed saga. Liberation's major distinction is that it's the first Assassin's Creed game that features a female protagonist. Aveline is the adopted daughter of a wealthy family in 18th Century New Orleans. Her societal standing allows her to move in the city's elite social circles, her race gives her the ability to don the guise of a slave and move unnoticed through the city streets, and her training as an Assassin gives her the agility to move across the city's rooftops and the lethal skills to quickly strike down her enemies. These three aspects of her character are represented through the game's persona system. The lady persona allows you to charm your way past guards and to get away with more before raising your notoriety. Unfortunately donning this persona also means that you lose the ability to fight effectively, and to climb and run altogether, which in turn makes it rather boring to play (although the umbrella dart gun the lady persona sometimes carries would make Q proud). The slave persona allows you to run, climb, and fight, but you won't be able to wield all of the weapons that you can while using the Assassin persona. Donning the Assassin persona automatically draws the interest of any guards that see you, and your actions will cause your notoriety to increase rapidly. Interestingly, you can perform actions in any guise to reduce the notoriety of any of the personas - killing witnesses for the lady, removing wanted posters for the slave, and paying off officials for the Assassin. You can change between the personas at special locations, but you're often restricted in which ones you can choose depending on where in the story you are. While Aveline is an unusual and interesting protagonist, the story never manages to flesh out her character. The cutscenes are short and disjoint, serving more to provide an excuse for the next few missions than to form a deep and cohesive narrative. The story bounces around and at times involves voodoo cults, bayou smugglers, and Templar plots to unearth Mayan artifacts, changing gears as often as portable gamers switch between games, which is probably a big part of the problem. The game's portable origin probably necessitated a story told in bite-sized chunks, and one that was easy to follow even when some time has elapsed between play sessions. However, with the game's move to home consoles the gaps and inconsistencies become pretty obvious. Things will be even more challenging to those who haven't played an Assassin's Creed game before because Liberation just assumes that the player already has a strong familiarity with the franchise. The confusion experienced by the uninitiated can be particularly bad when the game starts injecting references to corrupted DNA memories and Abstergo Corporation into the story, neither of which is explained in the least bit. When the game clicks it can be as fun as the full-fledged console releases in the series. Racing across the rooftops of 18th Century New Orleans and delivering a double assassination kill on unsuspecting guards from above can be thrilling. But at other times (and all too often) there are seemingly endless slogs across the bayous and missions filled with fetch-it quests and other rudimentary objectives. There are also issues with the game's programming that include random game lockups and AI issues. I've seen AI guards walk off of the side of a ship or follow me into a corner with their awareness level stuck somewhere in the middle of the meter. And the camera far too often manages to swing behind a tree or other obstruction during battles. The game's story will give you about ten to twelve hours of gameplay, which is not bad at all for a downloadable game. The game doesn't provide all of the side activities you'll find in the other Asssassin's Creed games, but there are collectibles such as treasure chests and diary pages to find - although by the time you finish the game's story you will have scooped most of them up along the way. Assassin's Creed Liberation is definitely a cut below other titles in the series, and is probably best left to completionist fans of the series. If you're looking at the game as an inexpensive introduction to the series, you're far better off just taking the full plunge and jumping into Black Flag. Trust me, you'll be very happy that you did. Final Rating: 68%. It may have been liberated from the PlayStation Vita, but it still feels like a portable game.